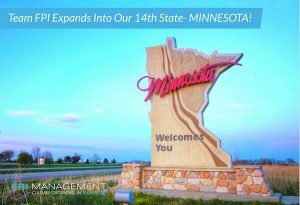 FPI Management Expands Into Minnesota - FPI MGT. FPI Management is proud to announce that one of it’s longstanding clients has bestowed them management of a beautiful asset in Eagan, Minnesota. This growth has expanded Team FPI’s multi-family property management service into Minnesota. This makes Minnesota the 14th State FPI Management offers multi-family property management service in. FPI could not be more excited for the new venture.